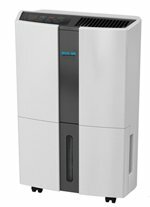 The Eco Air ECO14LDG Dehumidifier is very similar to the ECO14LDF but incorporates some improvements and is a little more expensive. The ECO14LDG is a small to medium capacity dehumidifier for home use and has the capacity to control humidity in an area of up to 20m2 (approx. 215 sq ft). This is the area of a single larger room within a home or a small apartment for one person. This dehumidifier is of modern appearance and is neatly designed to suit areas where space is limited. It has all the capabilities required for home use and will be effective within the floor area limits for which it is designed. The Eco Air ECO14LDG Dehumidifier is capable of removing 14 litres of moisture per day from the air at an ambient temperature of 30°C and relative humidity of 80%. These conditions are typical of those used by most manufacturers to express the water collecting capabilities of their dehumidifiers when selling to European Markets. Dehumidifiers pull much less water from the air in cooler temperatures and/or when relative humidity is lower. In the conditions typically found in the UK it is unlikely that a dehumidifier would produce more than half the stated amount of water in 24 hours and often much less than that. The figures are useful in comparing two dehumidifiers and will tell you that a 20 litre unit will always extract around twice as much water as a 10 litre dehumidifier if both are operating in identical conditions. What they do not tell you is the amount of water you can expect to empty from the water collection container every day and it does not indicate a fault in the unit if the figure is no more than four or five litres for a "14 litre" unit. Since the water collection container only holds 2.9 litres this is probably a good thing but it should be pointed out that most dehumidifiers of this size will have "buckets" of about the same capacity. If emptying the bucket once or twice a day is an unwelcome chore, or if you will be away from home and want to leave the dehumidifier running, there is an alternative. The Eco Air ECO14LDG Dehumidifier is configured for continuous drainage and has an outlet in the casing to which a small bore plastic hose may be attached and run to a convenient drain to dispose of the "condensate", the water condensed from the air on the cold coil. The water is drained by gravity so the drain must be at a lower level than the outlet from the dehumidifier. For the most effective operation it is helpful to locate the dehumidifier on a surface raised a few feet above floor level. A second consideration, if the dehumidifier is to be left to work unattended, is the possibility of a power cut. Unlike many similarly priced dehumidifiers the Eco Air ECO14LDG has an auto-restart feature which will switch the unit back on once the power is restored. A common concern when choosing a dehumidifier for a smaller area is finding space to put it. The Eco Air ECO14LDG is less of a problem in this respect as it is compact for a unit of its power. The unit is just 33.5 x 21.4 x 51.0 centimetres and will be easily fitted into a tight corner. Inevitably the dehumidifier will have to be moved from time to time and the ECO14LDG is justly described as a portable dehumidifier. It weighs just 11 Kg and has both a top-mounted carrying handle and castor wheels to aid movement. Another common requirement of dehumidifier buyers is for a quiet machine. Frankly there is no such thing as a quiet dehumidifier. The main source of noise is the fan and if the fan was not working you would hear the compressor. Beware sales people who tell you that this or that dehumidifier is "whisper quiet". This is what Sir Winston Churchill would have described as a "terminological inexactitude". Dehumidifiers are either more or less noisy and the Eco Air ECO14LDG Dehumidifier is one of the less noisy units available. Its noise output is 43dB which is low by dehumidifier standards. Humidity is regulated by a humidistat which should ensure that the dehumidifier only operates when relative humidity rises above the preferred level. Humidistats are not always as precise as might be wished and it may be wise to invest in a hygrometer to measure the relative humidity independently and adjust your settings accordingly. We would advise that relative humidity should be maintained at, or a little below, 50% if you wish to be assured that mold and dust mites are controlled. The Eco Air ECO14LDG Dehumidifier is an entirely sound choice for use in the living areas of any home. It can not be recommended for use in areas such as a garage where ambient temperature may be very low for extended periods. The ambient operating temperature of this unit is stated as 5°C to 35°C and it does incorporate an auto-defrost function. This senses the formation of ice on the cold coil of the unit and turns it off until the ice melts. For effective operation in a garage in winter a more sophisticated "hot gas defrost" is required which is only found on more expensive dehumidifiers. Alternatively a desiccant model could be used, such as the Eco Air DD122FW, or a model from another manufacturer.